No, it’s not me in the suit. But I do lead tours in the Rocket Garden behind him. If you’re a regular reader of this blog, you know (1) my wife and I moved to Florida almost two years ago, and (2) I’ve posted less and less in recent months. I’ve posted occasional updates about our Florida adventure, which was motivated mainly by our desire to live in the “Space Coast” which is the local nickname for Cape Canaveral, Cocoa Beach, Merritt Island and nearby locales. 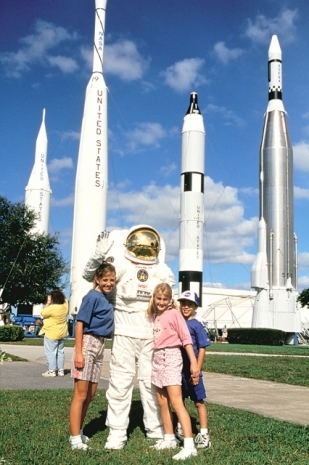 One major objective was to be hired as a Communicator at the Kennedy Space Center Visitor Complex. And after nearly two years of waiting for a position to open, I was hired last month. A Communicator is a tour guide, but also much more. We’ve been described as “NASA experts” and “NASA ambassadors.” Technically we don’t work for NASA. We work for Delaware North Parks & Resorts, which has the contract to run KSCVC for NASA. But the public doesn’t know any different, and of all the NASA contractors we’re the only ones allowed to wear the NASA logo. I suspect that not all the Communicators are passionate about space exploration, but it helps. Two positions were open, so when called for an interview I figured I had to do something to stand out. We were told to prepare a brief presentation about the next Space Shuttle launch, so I brought from my collection a Shuttle model to use as a reference. When I walked into the interview, four people sat on the panel. One was a former astronaut — in uniform — who’s now an executive at the park. I’m sure that was to see if we could be intimidated. Well, I got the job, so I must have done well enough. Most of my days are filled by leading the Discover KSC tours, which take guests to visit historic locations, including within about a mile of the Shuttle pad. We’re also assigned as “pathfinders,” meaning we wander the facilities encountering guests to answer their questions (the most common being, “Where is the bathroom?”) and interpret the exhibits. NASA likes the pathfinder roles so much that we’re being assigned more locations. Obviously I have a lot to learn, so it’s eating up all my free time. I update FutureAngels.com in the morning, then it’s off to KSCVC for the day, and evenings are spent reading books or researching NASA technology on the Internet. As much as I love the Angels and their minor leaguers, I feel like I’ve been given a higher calling. People from all over the world come to visit KSCVC, especially near launch time. We are ambassadors not just for NASA, but for the United States. I gave serious thought to shelving FutureAngels.com this spring, but finally decided it was too important for those of you who follow the Angels’ minor leaguers to shut it down. For now, though, it’s in second place in my life. Hopefully you understand.